[Lucid Science] shows us how to make some simple reed switches. Reed switches are simple components that detect a magnetic field and can close or open a circuit once detected. While not really a thing of beauty, these DIY reed switches should help you out if you just can’t wait to order some or you fancied trying your hands at making some components from scratch. Reed switches normally come in very small form factors so if you need something small then this may not be for you however the video does show you on a macro scale the fundamental workings of a reed switch. To make your own reed switch you need only a few parts: some copper, enamelled wire and magnets. They really are simple devices however sometimes it’s easy to overlook how simple some things are when they are so small that you can’t really see how they work. Every week Hackaday.io features an AMA of sorts. This is the Hack Chat, a chatroom where we sit down with the best in the business to talk about manufacturing techniques, engineering, and how to build the best hardware around. Over the last few months, we’ve hosted a few hardware celebrities, from [Sprite_TM] talking about the ESP32, [Lady Ada] and MicroPython, [Roger Thornton] of Raspberry Pi discussing how to build everyone’s favorite Linux computer, [Samy Kamkar] talking about reverse engineering, and heard [bunnie’s] take on making and breaking hardware. Now we’re looking for new co-hosts to lead a discussion and be the expert in the room. If you have the skills, we want to hear from you. We’re looking for experts to lead a discussion on what they’re doing. If you have a new hardware product and want to share the story of taking it to production while getting some feedback from the Hackaday community, this is the place to do it. We’re looking for a wide range of people who will allow us to pick their brains. If you’ve ever designed a 16-layer PCB, we want to know how (and why) you did it. If you’re into building robotics, we want to hear from you. If you’re an embedded systems wizard, this is your time to shine. If you want to get in on this, send us an email. We’re doing one Hack Chat a week, every Friday, sometime around noon, Pacific time. This is a great opportunity for you to share what you know with one of the best hardware communities on the Internet. It’s also great practice if you’re thinking about presenting at the Hackaday SuperConference in November. This Week: How do Magnets Work Anyway? Do you know how magnets work? Of course you don’t, nobody does. But one of the people with the deepest knowledge on the topic is Jeremy Chan who is a Prototype Engineer at Nano Magnetics Ltd. 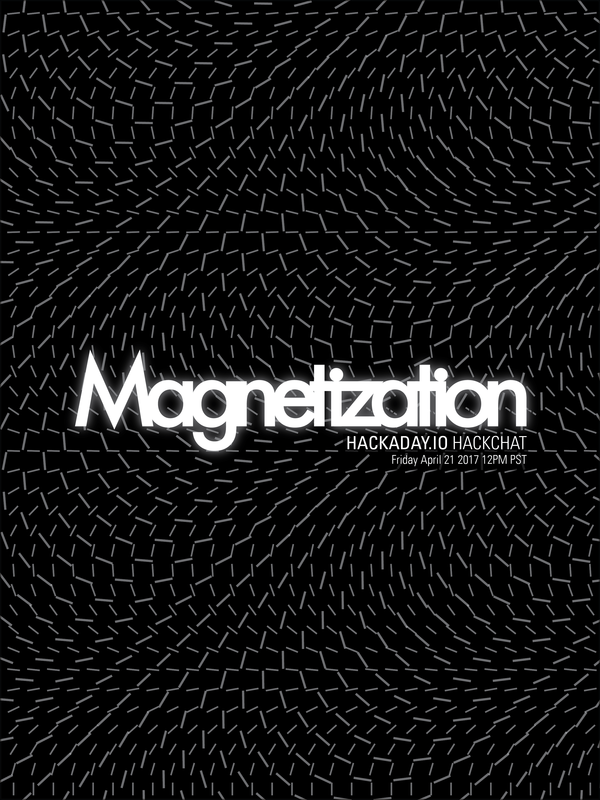 This Friday at noon PST Jeremy leads a Hack Chat on magnetism. What is there to talk about? Jeremy will cover how magnets are manufactured and magnetized. He’ll cover the different grades of magnets, and the different magnetic sensing mechanisms. He’ll also go into some of the most interesting magnetic phenomenon. How often do you get to hang out with a magnet expert? See you this Friday! Two weekends ago was the Bay Area Maker Faire, and lacking a venue to talk to people who actually make things, we had a meetup at a pub. This brought out a ton of interesting people, and tons of interesting demos of what these people were building. By either proclivity or necessity, most of these demos were very blinkey. The demo [Grant McGregor] from Monterey Community College brought was not blinkey, but it was exceptionally cool. He’s levitating objects in paramagnetic liquids with permanent magnets. Levitating objects in a paramagnetic solution around a magnetic field has been an intense area of research for the Whitesides Research Group for a few years now, with papers that demonstrate methods of measuring the density of objects in a paramagnetic solution and fixing diamagnetic objects inside a magnetic field. [Grant] is replicating this research with things that can be brought to a bar in a small metal box – vials of manganese chlorate with bits of plastic and very strong neodymium magnets. The bits of plastic in these vials usually float or sink, depending on exactly what plastic they’re made of. When the paramagnetic solution is exposed to a magnetic field, the density of the solution changes, making the bits of plastic sink or float. It’s a bizarre effect, but [Grant] mentioned a nurd rage video that shows the effect very clearly. [Grant]’s further experiments will be to replicate the Whitesides Research Group’s experiment to fix a diamagnetic object inside a magnetic field. As for any practical uses for this effect, you might be able to differentiate between different types of plastic (think 3D printing filament) with just a vial of solution and a strong magnet. [Grant] was heading out of the pub right when I ran into him, but he did stick around long enough to run into the alley behind the pub and record an interview/demo. You can check that out below. People tend not to think about the non-Newtonian properties of foodstuffs, but we’re glad at least one person did. When it comes to cornstarch, it’s indeterminate viscosity when mixed with water made it the perfect solution for a pretty neat trick: making a liquid move in reaction to a subwoofer. The unique motion can be attributed to the physical properties of the solution: when enough force is applied quickly, it acts as a solid. Otherwise, it flows like a liquid. The erratic bouncing of the sound waves combined with a little tactile manipulation create varying degrees and speeds of applied pressure, which in turn create a mass of flowing shapes that almost appear to be alive. We’ve covered weird fluids before, but this is perhaps most similar to SnOil, a game that uses ferrofluids to achieve a similar result. 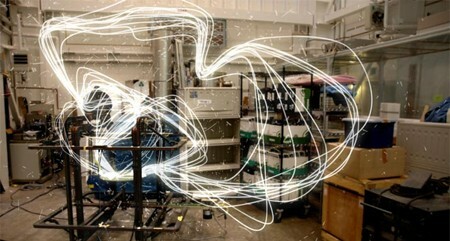 SnOil, however, does not depend of vibrations to create shapes in the fluid, it uses small electromagnets and magnetically charges liquid instead. We love the ordered appearance of the SnOil unit, but the chaotic motion of the cornstarch and it’s non-Newtonian properties make it appear almost otherworldly. We wonder how ferrofluids would react in a situation similar to the cornstarch above, since it would respond to both the vibration and the voice coil’s magnetic field.